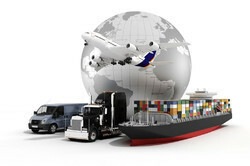 Leading Service Provider of international freight forwarding from New Delhi. Being one of the eminent names of the market, we are involved in providing services of International Freight Forwarding for Export. Under these, we make sure that the cargo is delivered safely and within the committed time period. Known for their reliability, flexibility and budget-friendliness, our services are massively applauded among our esteemed customers. Looking for International Freight Forwarding for Export ?